Camper cushions have a limitation when it comes to thickness. Most cushions are between three and five inches thick. When a thick cushion feels uncomfortable then it is most likely time for a foam replacement. On a camper, the thinner the cushion the quicker it sinks and the occupant feels the underlying surface. Another way to test a camper cushion is to check the center and the edges. Usually, cushions where the center loses density it is because it is only used for seating. In such cases, the foam should be replaced with higher density foam to ensure comfortable seating. Lastly, check for signs of water damage. Spillage during a journey is not unusual and continuous exposure to water can cause mold and other issues. One solution for this situation is to add a protector around the foam. Alternatively, use closed cell foam, although this will result in less comfort compared to memory foam. 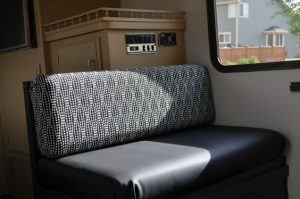 The Foam Factory has a special Dryfast foam that is ideal for RV cushions.